My visit to The Tea Project starts with a squirt of scented water over the top of my head. Like a smoking ceremony, this Tea Project ritual is supposed to cleanse and help me relax. But I know it’s really about preparing my head for the mind-boggling choice of teas on the quirky tea menu. It’s a big ask to narrow down your choice to a single tea from a starting line of 70. With names like Irish Rum and Cream, Cream Tea Sauvignon and the cheeky Novocastrian Breakfast, it’s an unfair burden to put on a customer. There’s a tea for every taste; chai, green tea blends, oolong, white, herbal – it’s insane! Luckily the selective food choices are top-notch. The melt-in-your-mouth scone tastes dreamily creamy and fresh, and pairs well with the delicate flavours of the housemade rose-water jam. The fresh cream is on the light side, but the sprinkle of rose petal tea leaves takes it up a rung on the presentation ladder and wins me over. After spending so much time hovering over the menu I try hard not to leave with a bag of teas, as 50 and 100 gram take home packs are available. Tea: A sensational selection of award-winning (yes truly) house blended loose-leaf teas served in either a pot for one or two. Overall: A tea world hipster vibe. Only a few minutes walk separates Toronto’s cafes and the shores of Lake Macquarie. From the outdoor seating area of Doubletake Cafe, the lake and it’s well-manicured shoreline beckon, promising a chance to walk off sweet indulgences. By the time I arrive at the cafe (lunchtime), the scones have already sold out, even though they are on the menu. Luckily, the kind kitchen staff whips up a couple just to keep us customers happy, and we settle in to the lake view. The scones, fresh out of the oven, have a delicate creamy taste that pairs exceptionally well with the rich berry preserve and double thick cream. Now for that walk! Tea: A basic range of loose-leaf teas and a few specialty teas served in a small pot. Overall: Alfresco dining with friendly service. I’m back visiting Lee Rowan’s Gardenworld, but this time the Warners Bay store. It feels more established and compact compared to the Ourimbah outlet, but the stock looks the same (or thereabouts). If you’re not here for the plants, then wander the gift shop for garden ornaments, homeware, wallets, costume jewellery, and gardening implements. The Gardenia Cafe shares the same building as the gift store, with tables spilling out into a small courtyard overlooking the nursery. If you prefer to stay indoors, the high ceilings and floor to ceiling windows gives the cafe an airy feel. The single serve scone is definitely made to order, and arrives crisp and out-of-the-oven fresh. The strawberry jam is better than average, and the cream is impressive; slightly sweet and thickly whipped. My tea arrives promptly and before my scone, unlike the sister cafe in Ourimbah. Tea: A small range of loose-leaf tea served in a plunger pot. Overall: A basic and small range of loose-leaf tea served in a plunger pot. Poppy’s Garden & Homewares is exactly that; a garden centre that probably sells as much homeware as it does foliage. So by the time you reach Poppy’s Verandah Cafe after perusing furniture, cushions and candles, and the rest – you’ll be ready for a cuppa. Bright and airy, the cafe feels large, and although there’s lots of seating, the table configuration of twos and fours allows the space to still retain some intimacy. The scones are hard to beat; crispy on the outside, fluffy on the inside, and so ridiculously fresh that they must be straight from the oven. It’s a shame about the sickly sweet raspberry jam, it’s okay, but these scones deserve better. The cream is way too light, that I can barely taste it. It’s a real shame when cafes can’t get the three components right. 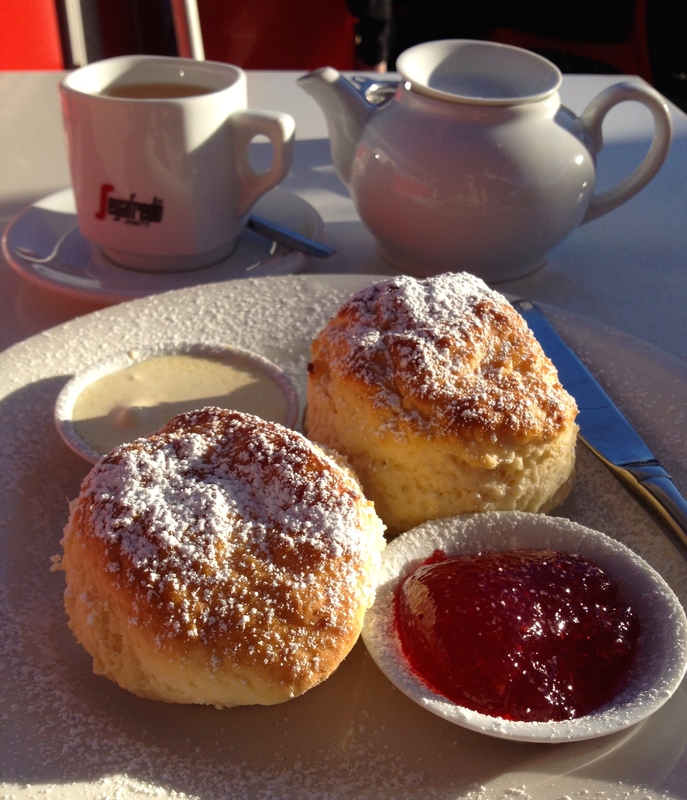 Why have perfect scones watered done with below average jam and cream? I’m yet to find out! A couple of petty gripes – the lip of my coffee cup is cracked/chipped, and the teeny tiny plate that doesn’t give me much room to dress my scones. Gluten free scones are available. Tea: A handful of choices, all loose-leaf, and served in a small pot. 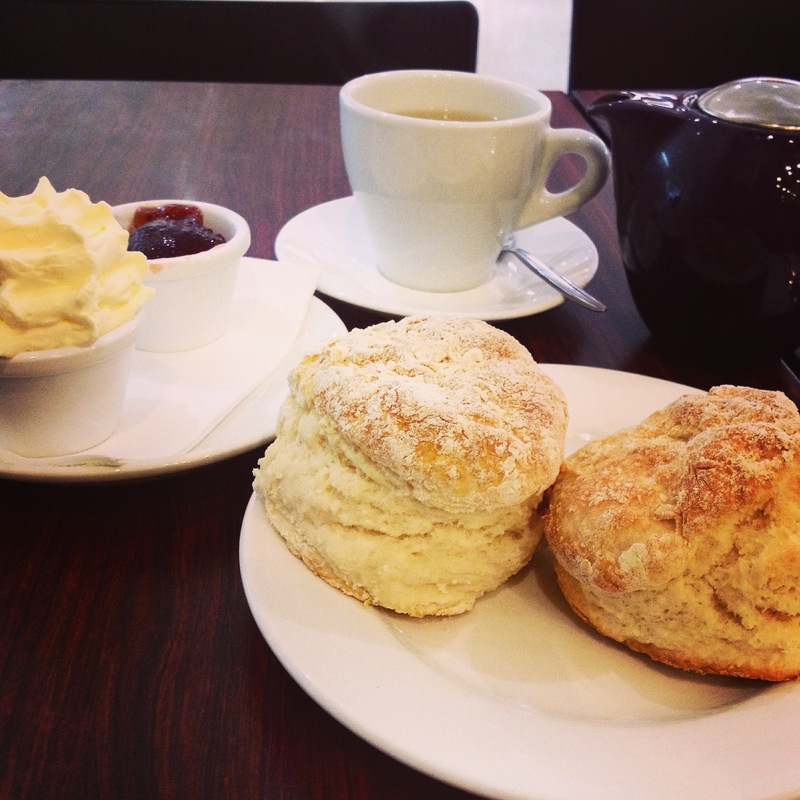 Overall: Top rated scones and shopping – not a bad combination. As far as plant nurseries go, Wyee Nursery is up there with my favourites. Ignore the mostly kitsch giftware in the shop; the cosy nursery is big on personality. Not here are the sterile rows of greenery, but a collection of exotic (does a Venus Flytrap count?) and native plants, flowers of every hue, and healthy herbs. The open-plan cafe is virtually embedded within the nursery, which adds to the convivial atmosphere. I hear some talk of a bird aviary, but I leave that to a bunch of kids who trots off down to the bottom of the nursery. The date and plain scones are fresh, wholesome and more-ish. I choose the pain, but stop at one. Sensational: fluffy with a creamy texture. The Chantilly cream is sweet and slightly overpowers the vanilla beans, but it’s truly an added bonus. The only downfall is the strawberry jam – nothing more than average – but with scones and cream this good, I’m happy to overlook it. Tea: A small selection of Pickwick silk tea bags served in a small pot. Overall: A quirky plant nursery serving sensational scones. Terrigal Haven surely offers some of the best views in the area. With a few lookouts and a couple of cafes/restaurants perched waterside, you’re never short of a nourishing seaside view. 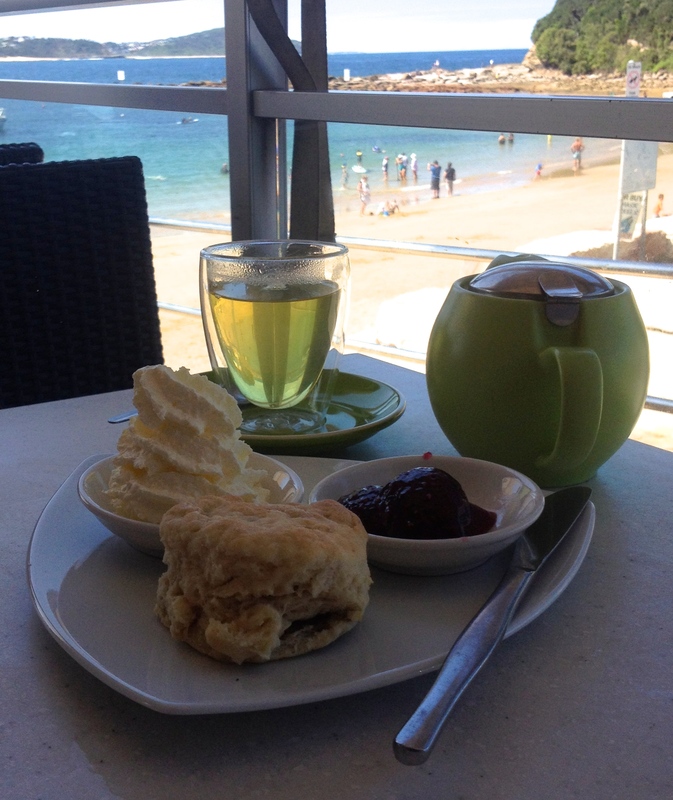 If you’re visiting to dive the HMAS Adelaide wreck that was purpose prepared and sunk in 2011 to form an artificial reef off Terrigal and Avoca Beach, then you won’t have far to go for a ‘after dive’ scone. In the same building and right next door is Cove Cafe, which incidentally has uninterrupted ocean views. By the looks of things, they change scone varieties daily, and today they have banana scones. Yep, you’ve heard it, banana scones. This is a first for me and the chunky banana embedded scones definitely work. Moist and soft and served with ample and decent raspberry jam, the only disappointment is the too light cream. 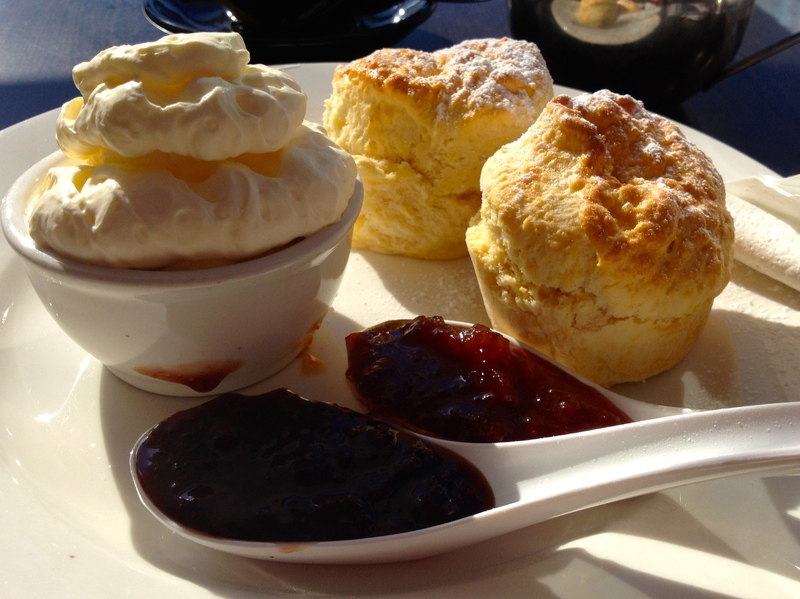 No biggie, the scones are still worth the trek even if you aren’t diving. Tea: A large choice of T2 loose-leaf teas served in a good-sized pot. Overall: A magical place looking over Terrigal beaches and the coastline beyond. Just a few minutes off the M1 (Sydney to Newcastle motorway), is Ourimbah. A sleepy Central Coast town that sees a few drive throughs from the motorway or locals doing business. Lee Rowan’s Gardenworld is easily accessible, and if you are looking to stock up on garden plants and bags of soil, and the odd piece of costume jewellery, then this place is as good as any. The large and slightly sterile Gardenia Cafe is embedded within the nursery, so like me, you’ll probably enter and leave via the gift shop. There is lots of seating indoors, with some tables outdoors lining two sides of the building. 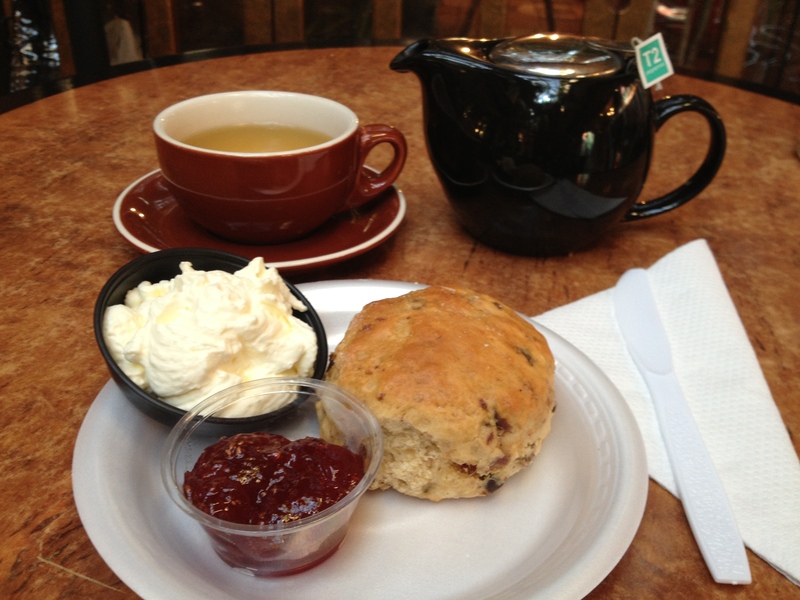 After I order at the counter and settle, my scone promptly arrives – but where is my tea (hence the lack of silver tea plunger in the photo)? There’s at least a 10-minute wait for my tea after my scone arrives. Due to the buzzing flies and my scone cooling down, I give up the wait and dig into the scone. 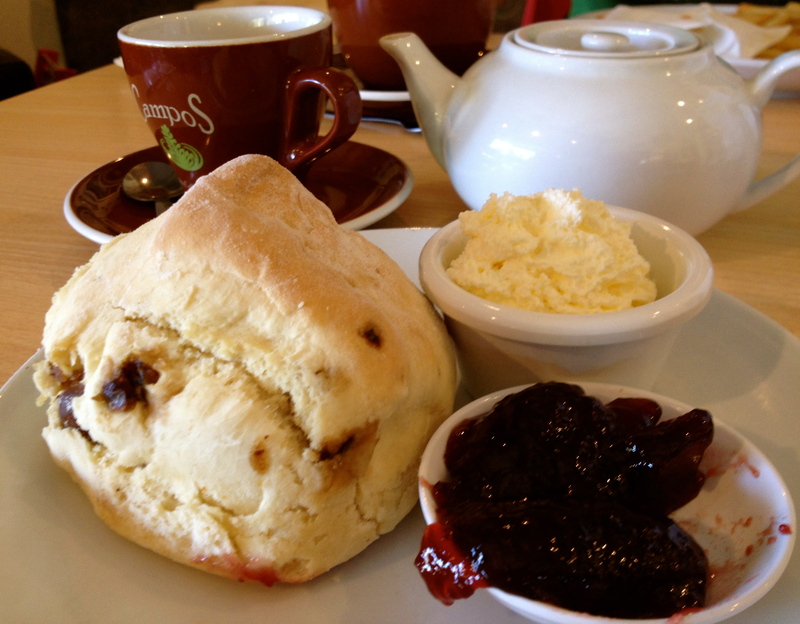 The scone tastes as though it has been baked to order, but has a distinct ‘scone batter’ flavour – but I could be wrong. It’s good but not great. The average strawberry jam is coupled with super light cream that’s been whipped up (but not enough) in a cream canister, and both don’t do the scone any justice. However, with a scone and a cuppa under your belt, why not peruse the nursery and the gift shop before hitting the motorway? Tea: A handful of standard teas served in a plunger pot. Overall: Large and slightly soulless, but handy for plant or giftware shopping. For me, the clincher is the quirky decor at Hatters Tea House, and that’s before I even see the tea menu. More akin to Sydney’s Redfern or Surrey Hills, I find Ettalong Beach an odd place to have such a funky cafe. There are several areas groups can sprawl out in including a semi private room and a sunny outdoor courtyard. If you manage to get through browsing the twenty-two teas on the menu plus the extra sixteen sold in the cafe, you can then admire the surrounds; pressed metal walls, hat boxes, retro tea sets and fancified gumboots, it’s an eclectic mix of 1970s furnishings and vintage trimmings. You have to order at the counter but at the same time get to salivate over the goodies on display. I want to try the creme brulee cupcakes and the gluten-free chocolate brownies, but then I remember I am here for the scones. 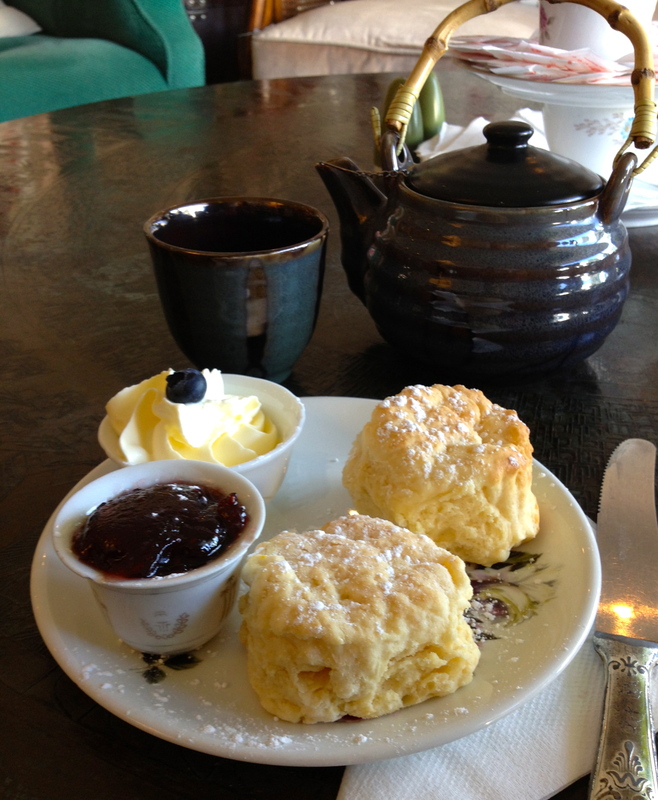 The scones, although small, are tasty and fresh and worth the hike to this corner of the Central Coast. The cream is light but freshly whipped and the blueberry on top is a nice touch. There’s a choice of raspberry or strawberry jam. The Devonshire Tea is served with either English Breakfast or Prince of Wales tea, but I drink neither of those and choose the Japanese Lime, which adds and extra 50c to my bill. Tea: 22 loose-leaf teas on the menu and a further 16 on the shelf that you can buy. Overall: A top choice for girlie get togethers. Open on weekends and public holidays, the undercover Ettalong Markets is more a relaxed shopping complex than a market,as we know it. Selling all manner of things, there are several restaurants and cafes, a variety of vendors, plus a cinema. I see the blackboard advertising ‘Devonshire Teas’ and follow it over to a cafe that reminds me more of a kiosk, servicing tables in the middle of a courtyard. There are lots of sumptuous looking cakes in the cake cabinet and the large plain and date scones are stacked high on glass cake plates. 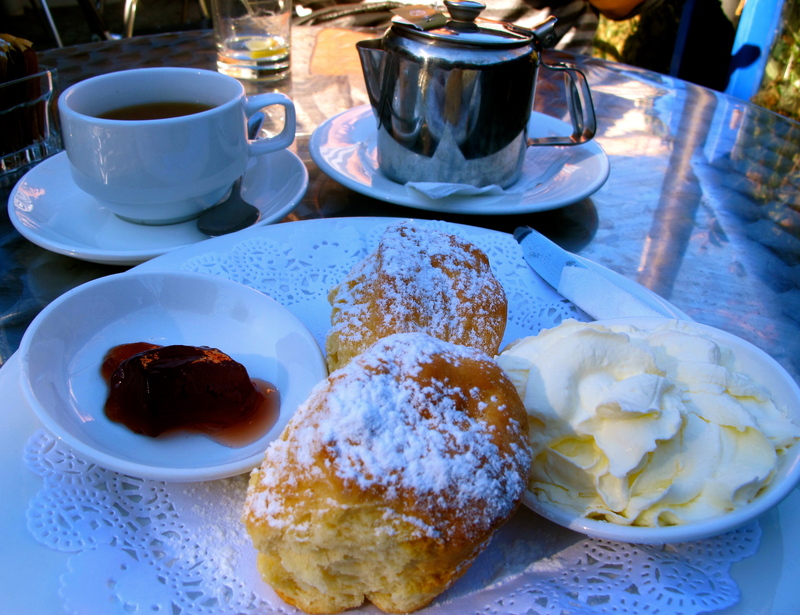 The serving with tea or coffee is for one scone with either cream and jam or butter, and is inexpensive. It’s served on a styrofoam plate with a plastic knife and feels very disposable. In keeping with the theme, perhaps the cup and saucer should be disposable too! Unfortunately my date scone is microwaved far longer than necessary, losing it’s flavour. The cream is very light and the jam stock standard. Tea: A good choice of T2 teabags served in a pot. Overall: A good place to take a rest from shopping. Gosford’s Regional Gallery is tucked away in a side street a few blocks from the main road and overlooks the Japanese Gardens. The place is a nice little diversion if you are passing by on a winter’s day as the gallery is worth a look, and although the Japanese Gardens are closed when I visit, they do look inviting enough for a short stroll. The place is designed for functions, but luckily when I sit down to take tea in the cafe it’s only busy with local lunchtime trade. The scones are fresh, crusty and on the small side. Unfortunately there isn’t enough jam and the cream is very light and airy. Nonetheless if you find yourself in the vicinity, drop by but make sure you ask for more jam! Tea: Teabags served in a small pot. Overall: Not bad for a gallery cafe. The sound of the muso’s mellow tunes wafts on the warm spring breeze, beckoning diners to come sit and listen. The Ark Coffee and Takeaway is a popular beachouse hangout serving diners in the open indoor area as well as having a kiosk counter for those not keen to leave the beach for long. Do a round trip walk from the tidal rock pool along the coast to Norah Head lighthouse. Enjoy the glorious views towards Budgewoi in the north, before heading back down Bush Street to drop into the cafe. There’s a choice of plain or date scones, and you can order as many or as little as you like. My date scone doesn’t rate high in the taste stakes, but it’s not inedible either. My partner spies the raspberry jam being dished out of a bucket with a Monbulk label on it, which tastes far better than some of the bulk jams served in other cafes. The cream is extremely light, and if the weather were a few degrees warmer, it would probably have melted before reaching my scone.